Hiking in the Mud Season: Where to Go & Facts You Should Know! Higher elevation soils take longer to dry out. And after an epic snowfall this winter, and heavy spring rains the trails will take longer than normal to dry out. A trail may be dry at the trailhead, but is muddy at a higher elevation this time of year. If you notice this happening, please turn around! Trails at lower elevations, dirt roads, and recreation paths provide excellent places for early spring walking. Ever wonder about who is in charge of all of the Vermont State Parks? Meet the Director of Vermont State Parks, Craig Whipple (shown right). Craig recently had a great opportunity to speak on the program "Positively Vermont" about the 'positive vibes' Vermont State Parks creates - the popular Venture Vermont Outdoor Challenge, great memories, camping, hiking, swimming, nature programs, and more! You'll learn about details of the Venture Vermont program, his tips on when to visit the parks, and the many benefits you can receive by getting outdoors. Watch the interview online. The first volunteer day of the season was a tough one! The weather at Lake St. Catherine State Park was cold, cloudy, and very windy, but this didn't dampen the spirits of eight hard-working individuals. Five AmeriCorps National Civilian Community Corps (NCCC) volunteers and three Green Mountain College students spent the day collecting broken branches and picking up trash. Having an extra sixteen hands makes getting a park ready for the season a much less daunting task. Lesley Porter, Branbury State Park's Ranger, was with the group during the day and commented on how great a job everyone did. She couldn't thank them enough! For their generosity and efforts, each volunteer received a Vermont State Parks punch card, good for 10-day use visits to any Vermont State Park. Seyon Lodge's unique huge backyard is a special place to spend time, hiking, fishing, spotting wildlife, and finding a spot to take in the fresh air. However, the next two months at Seyon are a little extra special for a few reasons. 1. The Fishing: As the weather warms and the bugs start returning, the fishing gets good, real good. 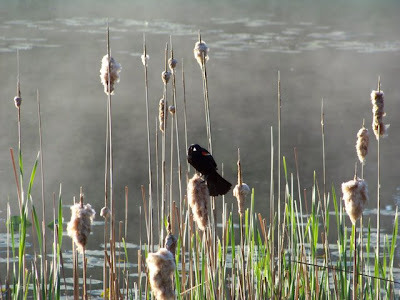 Seyon Pond is Vermont's only public fly-fishing only pond. The nearby state parks are quieter than in July and August, which makes Spring a great time for taking out a boat and casting a line for a big brook trout. For your convenience, rowboats are located on site. (If you're a frequent angler, check out the Angler's Special). Despite the chilly morning, Bomoseen State Park produced 35 species including a singing Ruby-crowned Kinglet and a singing Field Sparrow. Fox Sparrows were singing as well. Yellow-bellied Sapsuckers are back in full force. A pair of Black-capped Chickadees were excavating a broken tree stump. The lake is mostly open. Four Northern Shovelers (three male and one female) and a pair of Green-winged Teal were resting at the edge of some remaining ice at Crystal Beach. At the Lake Bomoseen/Hubbardton Marshes IBA at the north end of the lake, a Pied-billed Grebe and 78 Ring-necked Ducks were present among others. 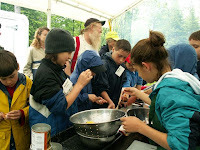 Families interested in exploring nature and learning basic outdoor skills are invited to participate in Becoming an Outdoor Family Weekend, June 3-5, 2011 at Stillwater State Park in north-central Vermont. The event is open to all families, but is geared to those new to camping or spending time outdoors. Families take over the state park for a weekend of camping and family fun. More than 50 different classes, will be offered throughout the weekend, all taught by outdoor professionals in a friendly, safe environment. Workshops include kayaking, outdoor cooking, fishing, mountain biking, nature photography, birding, GPS & Geocaching, hiking and more. Saturday night features a potluck supper with a traditional campfire. Campers also will have free time to enjoy all that the park, located on Groton Lake in the 28,000-acre Groton State Forest, has to offer from hiking to swimming and boating. Many of the flowers you see in the northwestern state parks are the product of a surprising source, the flower program at the Northwest State Correctional Facility. This women-only facility operates a flower program as part of their rehabilitation, which supplies some of Vermont State Parks with beautiful blooms. John Cross, the automotive teacher at the Community High School located in the prison, has helped to run the program for six years, though it was his son, Paul, who first thought of the idea. Paul, on staff at Grand Isle State Park, put his father's gardening program and the park's need for low-budget plants together, essentially creating the program that exists today.